This document records the multiple explorations carried out in the Spring and Fall of 2005 by the students in the Graduate Studios at the Taubman College of Architecture and Urban Planning at the University of Michigan. The Studios focused on Bombay and in particular on the Backbay area in south Bombay which is emerging as perhaps one of the most contested urban spaces in the city. This prime space in the city has slipped out of the perception of most citizens as a potential public space and an image center for the city. Severe contestation and incremental distortion have left the space sliced into bits that have no clear ownership resulting in gross misuse of the space. The city as literally turned its back to what could potentially be perhaps the most prime public space in the city. Thus, the agenda of the studios were to understand this condition and explore what potential strategies could be employed to reweave this space into the urban fabric of Bombay. The Spring Studio focused on a Mapping exercise of the context of the site and the city in general. This was followed by a Studio in Fall 2005 focused on the Backbay site in particular. The most interesting aspect of this exploration and the final design proposals was the simultaneous validity of these disparate design propositions and approaches. This prompted us to compile the different projects in a composite document with the intention of creating a body of work to suggest that the different fragments that compose the various projects could be seen to coalesce together in a collage like manner depending on emergent conditions in the city. Thus rather than being viewed as different projects and solutions they are really seen as components of a composite solution that respond to a dynamic urban landscape. In that sense they are a kit of ideas to deal with the broader issue of public spaces in the city of Bombay. This publication, by the Urban Design Research Institute, (UDRI) which collaborated closely with the Taubman College of Architecture and Urban Planning, is aimed at making the Backbay re-enter the imagination of the citizens of Bombay. 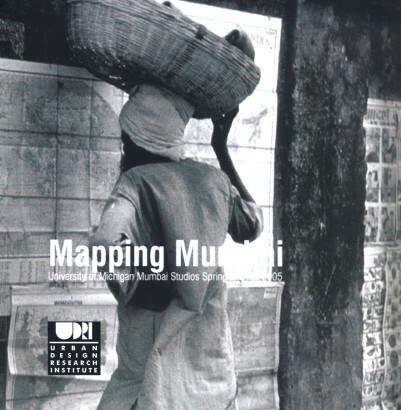 Also, the Studios documented in this publication are the beginnings of a series of exercises the University of Michigan and the UDRI hope to carry out in the coming years at the UDRI Mumbai Studio (which was established in June 2006) to focus on mapping, documenting and discerning the emergent patterns of urbanism in the Mumbai Metropolitan Region. It is hoped that these Mapping exercises will not only provide the city with useful documentation of emergent urban conditions in city but also trigger off discussions about how the city can be imagined and re-imagined. And how its urban form can be a useful mechanism to make the lives of its citizens humane and enjoyable.